Our travel photo of the week for this week is one we took while on a road trip up to State College in Pennsylvania. Yes...we are PENN STATE PROUD and always will be! This billboard sign sits along routes 322/22 and anyone traveling from Harrisburg to State College on that route will see it. It sits about 30 minutes outside of State College and if you are going up from the Harrisburg area it will be on your left. 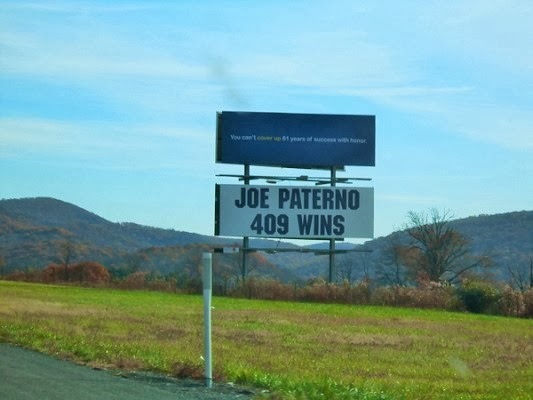 If you are leaving State College and heading towards Harrisburg, it will be on your right. Hubby and are I both big Penn State fans and we were also fans of Joe Paterno so we just had to stop alongside the road and grab a quick photograph of the sign! With all of the negative publicity the college has received along with Joe Paterno...we are big supporters and wanted to remember him in a positive way! If you love looking at mountains, valleys and small town America...this is definitely one route you want to travel when passing through Pennsylvania, especially during the Fall season when the leaves are changing their colors and before the bad winter weather sets in. There are plenty off pull-offs along this route where you can get out of your car, stretch your legs, do a little walking and you can get some great photos of some of our prettiest mountains, valley's, the Juniata River and more!